MyPhone announced the 3G version of their Rain series, from 2G connectivity now boosted to 3G and still tagged as budget friendly smartphone in the market today. This series won’t let you spend more than 3000 pesos to own a Jellybean Android phone. 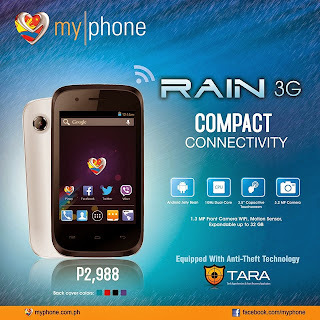 MyPhone Rain 2G cost only 1988 pesos and the 3G version you’ll only add 1 pesos to take it home. Rain 3G runs on a 1GHz dual core processor with 512MB RAM and a display of 3.5 inch. First thing to consider on this phone is the price, with that amount you can get a dual core Jellybean plus the 3G connectivity you can use for cellular networks. Second is the features, looking at the specs sheet you can tell that this handset will surely cater all the basics. From texting, calling, light gaming, file storage, connectivity and even safety features you can have that in Rain 3G. You can visit your nearest MyPhone resellers to avail this, as posted on their FB page it’s already available.